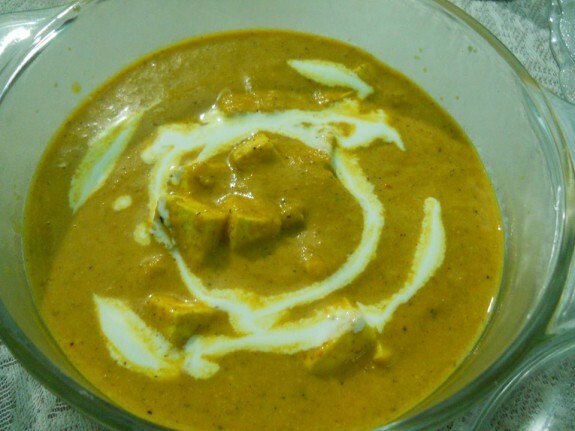 Shahi Paneer is a royal dish with dry fruits, yogurt, fresh cream, whole spices to make it a rich. So taste and feel the creamy yet sweet gravy aroma of this soft shahi paneer recipe. 1. Boil onions, almonds, cashews, magaz, garlic and ginger in 1 ½ cup of water for 8- 10 mins till onions become soft. Strain the stock and keep aside. 2. Make a thick paste of the cooked onion, garlic, ginger, dry fruits along with 1 or 2 tsp of strained water. 3. Heat oil in a pan and add all whole spices or garam masala ( bay leaf, 2-3 cloves, 2-3 green cardamom, 1-2 black cardamom, 1 inch cinnamon, ½ tsp caraway seeds) till they release the aroma. 4. Now, add the paste and sauté it for few minutes till it starts releasing oil from the side. 5. Add all the dry spice powder and mix well. 6. Now, add whisked yogurt, stock water, warm water, salt and sugar. Stir it well and simmer it to cook for 10-12 mins till the gravy thickens slightly. 7. Add cardamom powder and crushed saffron. Stir and add the paneer cubes. 8. Whisk the cream and add it. 9. Cook for 2-3 mins till paneer cooked. 10. Your Shahi Paneer is ready. You can garnish it with ream or coriander leaves and serve it with roti, rice or naan.